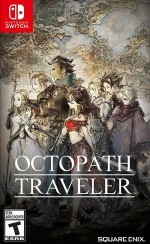 At its best, Octopath Traveler reminds me of my favorite 16-bit role-playing games. Strategic turn-based combat tests your skills, a job system gives you the freedom to tinker and optimize, and a fantastic retro aesthetic brings the world and creatures to life. 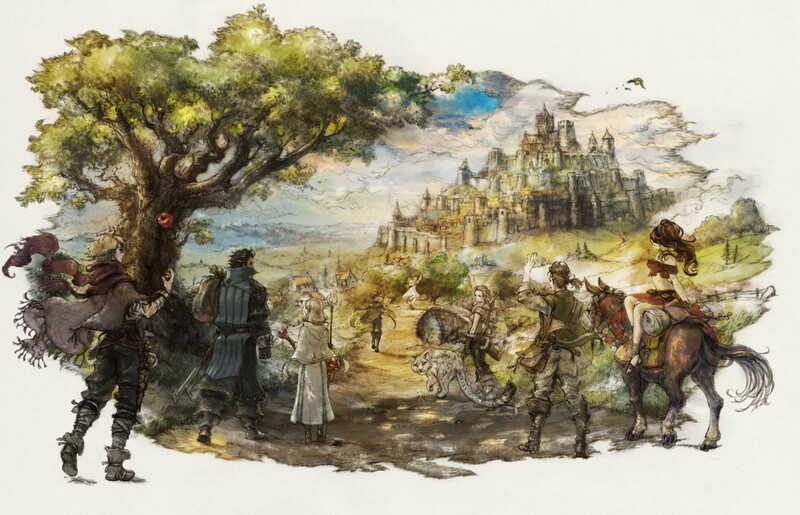 However, Octopath Traveler isn’t always at its best. 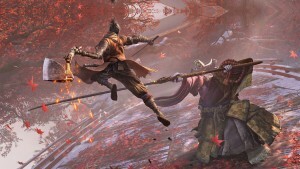 Over the course of its 60-plus hours, the adventure has wild variations in pacing and narrative, and has trouble settling into a groove. The result is a series of tantalizing highs and brutal lows, with the highs ultimately winning out. 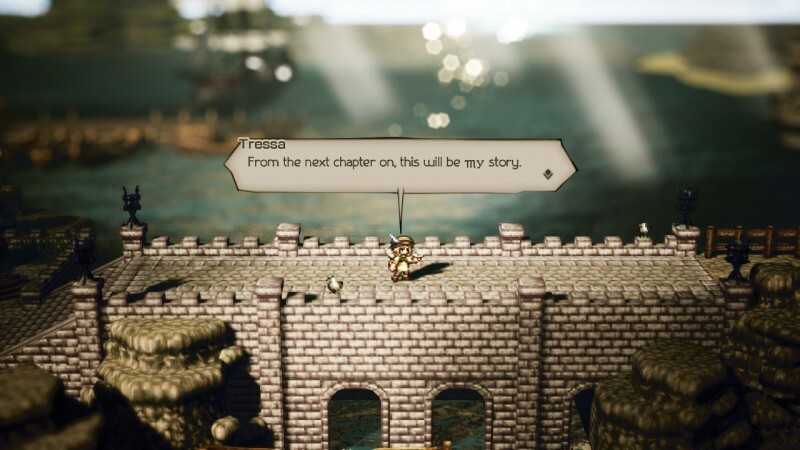 Octopath Traveler’s problems take a long time to surface. The early hours are amazing, with the dreamlike presentation and 2D/3D hybrid visuals drawing you in. 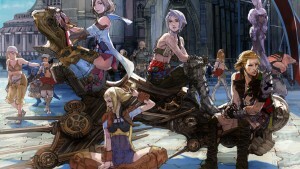 After choosing one of eight characters as your hero, you visit other towns to recruit the seven others. 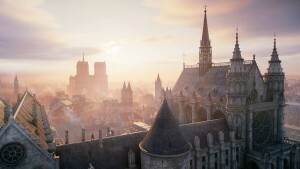 In every case, you play through a vignette (which lasts about an hour) that introduces the hero and their quest – a thief needs to steal jewels to salvage his pride, while a cleric embarks on a religious pilgrimage. This structure is unconventional and intriguing at first, but it doesn’t stay that way for long. In subsequent chapters, the narrative squanders its potential through dull repetition. 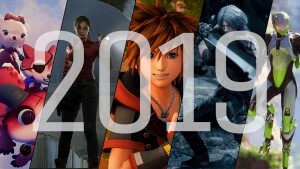 Each character has four chapters (32 in total), and almost all of those follow the exact same formula: Arrive in town, watch a scene, use a character-specific ability to accomplish a minor task like stealing a letter, then go into a short dungeon and fight a boss. I was often interested in the stories being told on a conceptual level (especially Primrose’s quest for revenge), but the predictable format and writing saps them of their surprises. Every character is exactly who they appear to be, and every betrayal and plot twist is immediately apparent. That doesn’t necessarily make them bad stories, but it makes them feel unremarkable. The eight main heroes rarely interact or acknowledge each other, and their tales never converge to unite the group in any common purpose. This approach does a good job putting specific characters in the spotlight with vignettes tailored to their personalities and strengths, but results in a disappointing lack of comradery or cooperation among party members. They’re just strangers who fight together sometimes. 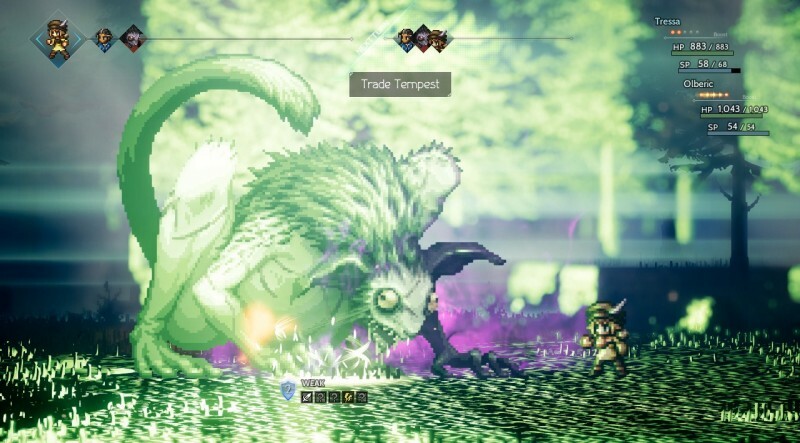 Combat is Octopath Traveler’s great redeeming force. The battles are fun and tactical, focused on coordinating your attacks to break an enemy’s defense to create the opening for an onslaught. This means carefully planning your attacks using the action queue, exploiting weaknesses, and reserving boost points for critical moments. I like how each character has access to a unique suite of abilities, like how H’aanit the hunter tames animals, or how Alfyn the apothecary mixes concoctions. This largely avoids redundant skills and ensures every character has an interesting role to occupy. 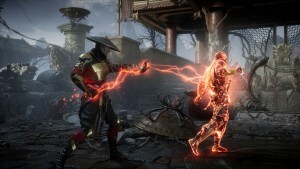 Your foes don’t pull punches, so fights provide a satisfying challenge. 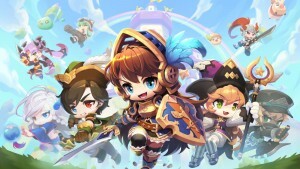 This is especially true of the boss fights, which often inject twists like disabling the attack command or draining your max HP every turn to apply pressure, forcing you to develop new strategies. In addition, these adversaries look uniformly fantastic; even a regular human boss becomes a stylish and imposing pixel-art masterpiece. Behind the scenes, a compelling job system gives your characters the flexibility they need to succeed. 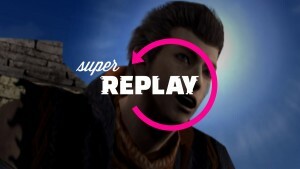 Once you unlock them, you can assign and swap secondary jobs as needed. 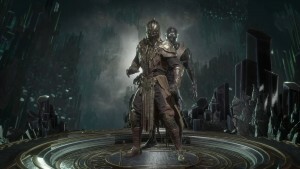 This provides your party access to additional weapons, helps them shore up stat weaknesses, and allows them to learn new passive skills they can equip regardless of their current job, like breaking the 9,999 damage limit or decreasing enemy-encounter rate. I loved experimenting with these possibilities (and hunting for the advanced secondary jobs), and the need to rotate party members prevents you from getting entrenched with a single configuration. 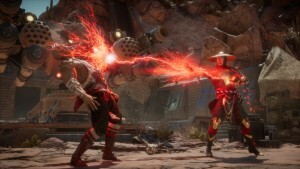 As much as I enjoyed the battle system, it doesn’t always feel fresh. After you finish one set of vignettes, your party probably won’t be strong enough to access the new content. 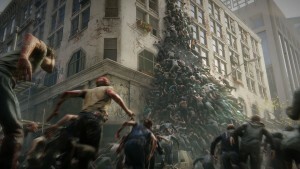 The only solution is to spend hours fighting the same monsters until you have enough experience to survive the next story chapters. This concept is an ancient relic of RPG design, and many fans have made peace with it, but that doesn’t make it fun. 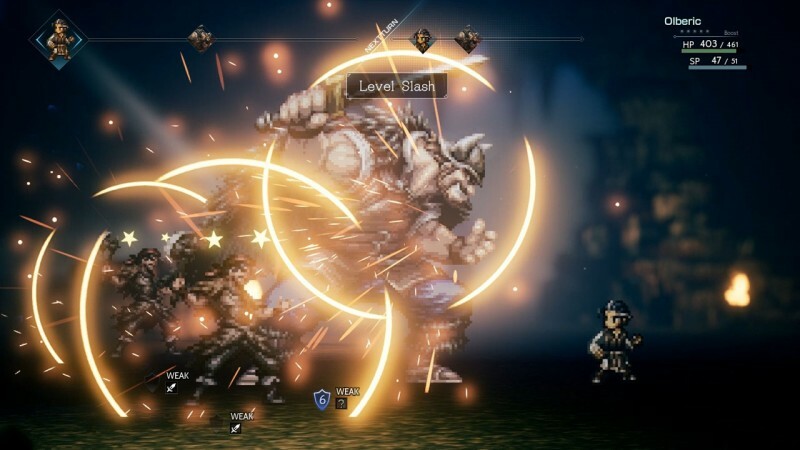 The grinding bloats Octopath Traveler and wastes your time, but once you’re past it, the frustration quickly abates as you renew your focus on what the game does well. 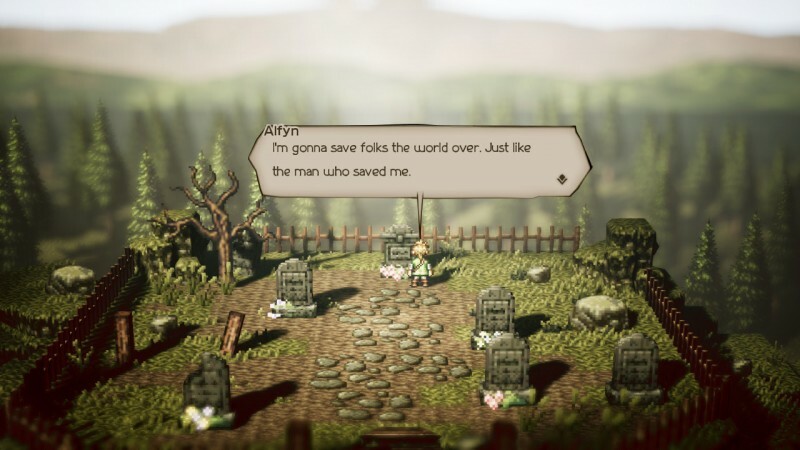 Octopath Traveler almost feels like a game from an alternate timeline – one in which titles like Chrono Trigger and Final Fantasy VI gave rise to a continuing lineage of RPGs that never strayed far from their 16-bit roots. 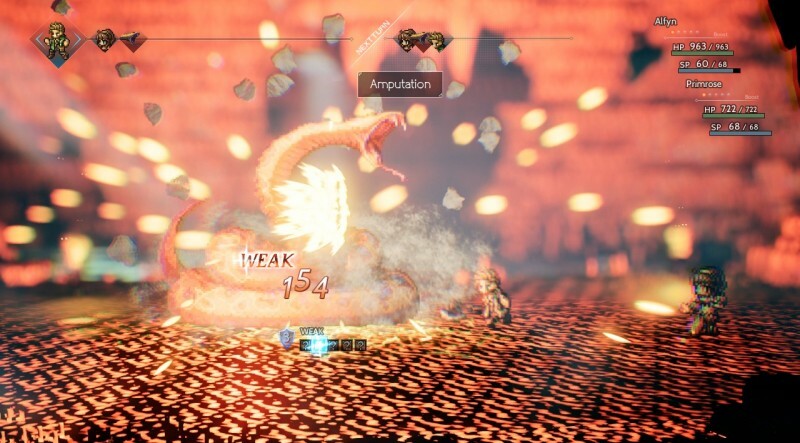 Yes, Octopath Traveler occasionally adheres too closely to antiquated ideas, but with its retro charm and inventive combat, it also takes exciting leaps you won’t see anywhere else. 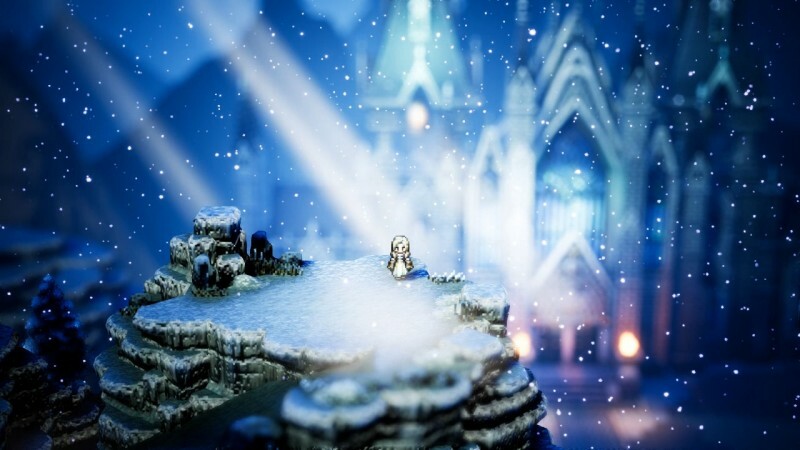 Octopath Traveler occasionally adheres too closely to antiquated ideas, but it also takes exciting leaps.